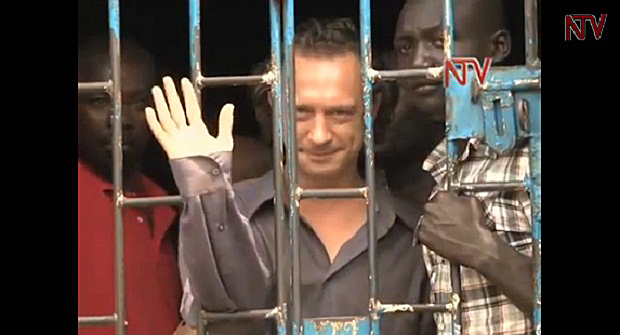 British theatre producer David Cecil brought worldwide attention to Uganda’s homophobic criminal code after he was arrested and charged for producing a “pro-gay” play in the country. The Anti-Homosexuality Bill, a version of which was first introduced in 2009, was passed just before Christmas and signed by President Museveni at the end of February, meaning certain homosexual acts are now punishable with life in prison in Uganda. The River and The Mountain tells the story of a successful young businessman who is killed by his employees after coming out as gay. Cecil was arrested in September 2012, when his theatre company refused to halt its production pending a content review by the Ugandan Media Council, and staged two performances in Kampala. The Council later deemed the play to be promoting homosexuality. Cecil spent four nights in a maximum-security prison and faced a two-year prison sentence or deportation if convicted. The case attracted media attention both in Uganda and abroad, and Index on Censorship and David Lan, the artistic director of the Young Vic, launched a petition calling for the charges against Cecil to be dropped. It was signed by more than 2,500 people, including director Mike Leigh, Stephen Fry, Sandi Toksvig and actor Simon Callow, bringing attention to the wider issue of gay rights and freedom of expression in Uganda. The charges were finally dropped on 2 January 2013, as the prosecution had failed to disclose any evidence. However, Cecil was re-arrested in February, spent five nights in prison, and was finally deported on the grounds that he was an “undesirable person”. Cecil was deported from Uganda as a result of his play. He has been nominated for the Index Freedom of Expression Arts Award and spoke with Alice Kirkland about what this means to him. Index: How does it feel to be nominated for the Index on Censorship arts award and why do you think you have been nominated? David: The honour is bittersweet, as I am unable to continue living in Uganda because of what I did; the last year has been fraught with anxiety and uncertainty. Since meeting your representatives in early 2013, I stumbled across a load of back issues of your magazine from the 1980s. Reading through articles by Umberto Eco and Ronald Dworkin made me feel part of something bigger, a story unfolding over time. I believe I was nominated because we were perceived as standing up for gay rights in a country where it’s hard to talk about homosexuality publicly. To me, at the time, we were just putting on a play and had little idea of how much impact it would have. Index: You spent time in prison in Uganda for your part in the production of the “pro-gay” play The River and The Mountain. What impact has this had on your work and life since the incident? Would you or have you produced a play since on the same topic in a country that implements homophobic laws? David: Since February 2013, I’ve been living in the UK as a deportee from Uganda, where I had spent 6 years building a career and a life with my new family (girlfriend and 2 kids, all Ugandan). With the recent (February 2014) signing of the Anti-Homosexuality Bill into law, plus other sinister developments, I now have to accept that Uganda is no longer safe for me and my family. So that chapter in my life is now closed and my family are now finally joining me here in London. This is a huge blow. One colossal irony in all of this is that our play was not actually “pro-gay”. It simply portrayed a gay character sympathetically and satirised the politicisation of sexuality in Uganda. The people who targeted us have done all the work of promoting awareness of homosexual issues in their country. Gay issues and rights are no obsession of mine. So, if I ever do tackle this subject again, it will be coincidental; I am primarily interested in the quality of a script or the enthusiasm of a moment. Index: By having your production shut down, spending time in jail and facing a criminal trial you obviously had your right to free speech quashed. How did this make you feel? David: Excited, then bemused, then frustrated, then furious, now a bit depressed – the latter mainly about Uganda, my erstwhile adopted country. Ugandan prison was very relaxing and even pleasant. Initially, I was in the section for remand prisoners, short sentences and white-collar crime. The people were friendly, relaxed and understanding. Later, I was locked up for a week in a crowded, rough police station. That had its interesting moments, such as ghost-story-telling by candle-light, and a brilliant cast of characters. I rose to become “resident police” (prison boss) by slapping a Fagin-type with a flipflop. My feelings are less important. I am not the victim in this story. The ones suffering are my family, and the Ugandan people. Index: Can you explain about the run up to the production of the play in Uganda? Were you aware before the opening night that running the show could land you in jail? David: It is important to note that the original genesis of the play comes from a meeting with a local theatre group, Rafiki. They, a group of young, heterosexual Ugandan actors and actresses, wanted to produce a play on the theme of “homosexuality”. I agreed to help, as long as it would be a comedy. Coincidentally, a friend of a friend was visiting from the UK at the time; this was Beau Hopkins, a poet and playwright, who agreed to work on the script according to a story developed in a collaborative workshop. Angella Emurwon, an award-winning Ugandan playwright, agreed to direct. It is important to note also that all the Ugandans involved are religious; one of them describes himself as a “devout Christian”. Fast forward 4 months. I was told a week before the press premiere night that we needed to get special clearance from the Ugandan Media Council (UMC). I had already tried to secure this three months before and was told it was not necessary. (The junior UMC worker who told me this was correct; normally, one would not have to get any clearance for a theatre play in Uganda.) In the end, the secretary of the UMC decided to politicise what we were doing and, at the very last minute, insisted that I sign a letter asking us to desist until they had reviewed the script with their 11-strong committee. Pius, the secretary knew that this meant the play would not be performed, due to subsequent commitments of the director and the key actors, as I had already informed him of all that. The letter was cc-ed to the prime minister’s office, the chief of police, the head of media crimes CID and the minister of ethics & integrity. Because the letter made no mention of legal consequences, articles or anything binding, I signed. I immediately visited a friend of mine, a human rights lawyer, Godwin Buwa, whose prognosis proved remarkably accurate in all but one regard. The letter was indeed a threat – it could not stand up in a court of law – however, one of the agencies cc-ed may try and act on it. I could be charged with something, possibly, but since the letter was so badly phrased, the worst I would suffer would be a few nights on remand. Since the case would have no water, I would be guilty of no crime and would not be deported. We had a meeting with the cast. My name was on the paper, they were not in danger. We had worked too hard to be bullied into silence by a badly-phrased letter. We agreed to go ahead and face the consequences. Perhaps I carried over an element of bravado from my experiences organising underground raves and music festivals in Europe, sometimes in the teeth of official sanction. At worst we had our sound system seized and threatened on numerous occasions, but always continued doing what we loved doing. Index: Your trial brought global media attention to the situation in Uganda regarding the Anti-Homosexuality Bill, but did this attention do anything to change the laws in the country? David: To make a faintly disgusting analogy, I think that much of the attention (from our case and others) has been like squeezing a pimple. It has brought the pus to the top. It was never my attention to directly talk about minority rights or the laws in Uganda — I would not presume to do so. It is none of my business, in every sense. What we were trying to do was to make fun of the nonsense surrounding attitudes to gays – the very bigotry and politicisation that took us down – without getting involved in a “right or wrong” argument. Our play was funny; it was entertainment. I hope that we changed the attitudes of some audience members. The problem with international activism is that it plays right into the hands of people who argue that homosexuality is a “foreign menace”. At least, people who care about these issues should spend a significant amount of time in the countries to understand why ordinary, sound people may be homophobic. Then they can judge and engage with them. Activism is a label with revolutionary connotations. I am certainly no activist. At most, we wanted to get people talking. Index: What role does freedom of expression have to play in discussions about homophobia, especially in countries where it is a crime to be gay? David: Without freedom of expression, government propaganda and lazy “common sense” prevails, especially regarding taboos or controversies. In a country where religious, ethnic and gender identities are so important and politicised, it is essential that we can discuss politics in terms of our identity, without fear of arrest. Index: How important are awards like the Index on Censorship one in advocating free speech as a human right? David: In Uganda, there’s a fantastic organisation called “Freethought Kampala”. They’d benefit from exposure and affiliation. I’d love to see the Index organising an event with their founder James Onen and his friends.